Warrington have tried every variant of rugby shirt design over recent years: hoops, stripes, pinstripes, weird triangles… whatever the hell is going on here… but a classic chevron containing the Wolves time honoured colours of primrose and white has often yielded the best results, and this time honoured formula has featured within both home and away designs during ISC’s tenure. 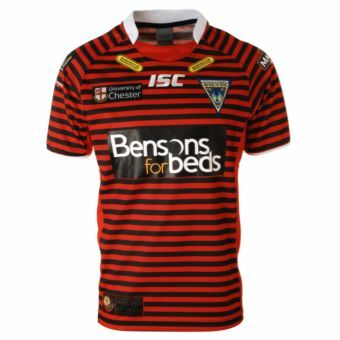 However – Warrington can’t seem to make their minds up about the damn thing – some year’s the V is used on the home shirt, other times it’s on the away, as was the case last season. Similarly, the use of white as a main colour seems to flip between the home and change designs. This year, however, we think Warrington have got things spot on in terms of colour and design choice for their principal shirt. Blue has been chosen as the main base colour and we think this is how it should always be for Warrington, with white relegate to a supporting role. And we have a V too. No surprise really, but it’s much thinner than we’ve seen before which is probably a radical change without being too overbearing. The biggest departure from recent seasons for this shirt is the club crest, which has been modernised from the slightly silly ‘insanity wolf‘ old style to a new, more stylised version, which is actually supposed to be a hunting dog as opposed to a full-on wolf. It’s an elegant design for an equally handsome shirt, but we do wish they’d altered the position of either the chevron or the badge and supplier logo. The Warrington shirt is a rare commodity in modern rugby as it isn’t cluttered up with sponsors, so why did they have to break up the V with badges like that? With a little bit of rejigging they could have fitted all the elements on here without breaking up the design. It’s a small quibble, but a quibble nonetheless. Neck detail is often seen as an afterthought, but the right collar design can often make or break a shirt. In this instance though, ISC’s 2016 collar is a real winner, and further adds to an overall feeling of sophistication and tradition – we like the primrose and blue mix, too, as it adds balance to the overall design. 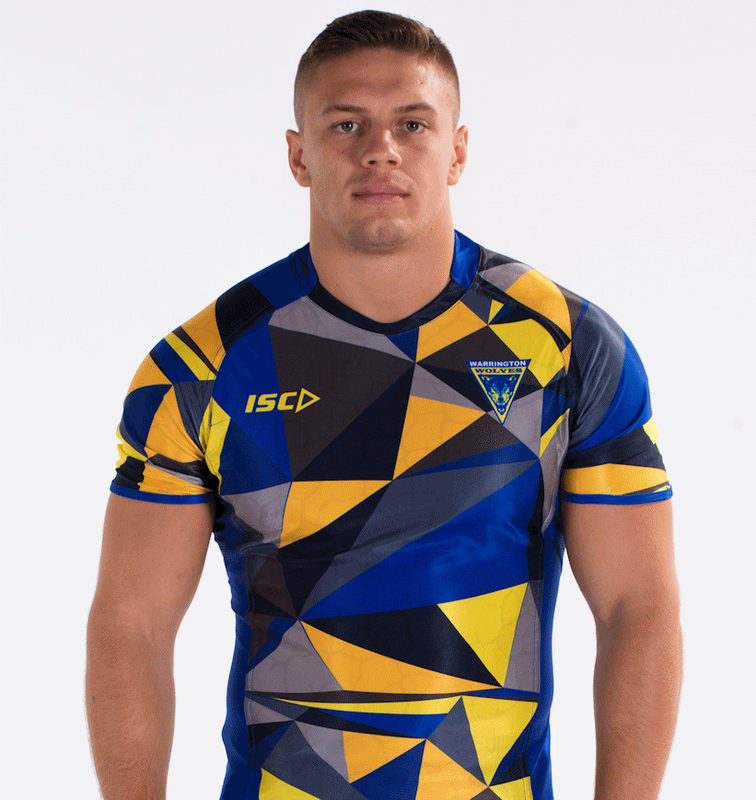 The 2016 Warrington home shirt is probably one of the nicest primary designs that the club has worn in Super League, so when we say that the away jersey not only surpasses its counterpart, but pretty much anything else ever seen either at Wilderspool or the Halliwell Jones, we trust you understand just how much we love this jersey. It’s 140 years since Warrington were formed by seven young men who called themselves the ‘Zingari’, this translates in Italian to gypsies and the Zingari team was one which wandered and had a nomadic existence, in those early days playing in scarlet and black hooped shirts. We love a nod back towards the past and with shirt design advancing so much over the years, away ensembles often provide clubs with a chance to give founding designs a contemporary facelift. It’s not the first time the club has drawn on that history of course – the 2012 away shirt took a very cool narrow-hooped approach to the concept, but we think this year’s take is significantly more elegant. We love symmetry within a shirt – everything looking neat and tidy and coordinated – and this shirt provides that in spades not only have you got the nicely ordered hoops, all the logos on the front of the jersey are just plain, handsome white, even the club crest. Messing with the colours of the club badge is a controversial move in the eyes of many fans, but in an era where many clubs have garishly-coloured sponsor logos ruining otherwise lovely designs because the company in question wouldn’t create a monochrome version of their logo, this commitment to uniformity is all good with us. What really makes this shirt stand out for us however is perhaps a small inclusion – the gold sleeve embellishments. They’re a little thing, but it’s a touch that just shouts class, or in Warrington’s case, perhaps that should be howls…? With a gorgeous home design and an even better change shirt, there’s little doubt that when it comes to style in Super League, the Warrington Wolves are leading the pack.